An exercise test was performed on a bicycle ergometer while subjects were breathing dry medical air in order to assess the presence of EIB, as well as the VL (see below). The power output was increased during the first 4 min in order to reach a target ventilation output that was > 60% of the predicted maximum voluntary ventilation (35 X FEV1) according to standard recom-mendations. To ensure that the ventilatory stimulus for EIB was sufficient, the exercise duration was modified compared with recommendations to a total of 16 min (ie, 12 min at target ventilation). In addition, increased exercise duration may lead to bronchoconstriction during exercise itself, and we hypothesized that this bronchoconstriction may promote VL. 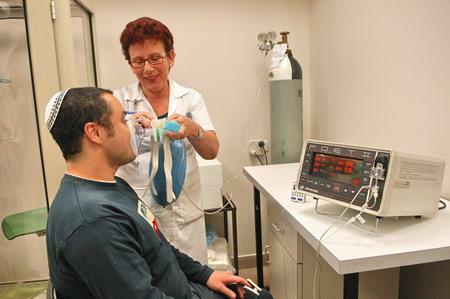 Spirometry was performed preexercise and postexercise (1, 3, 5, 7, 10, and 15 min after the end of the exercise). A mean (± SD) interval of 6.2 ± 1.5 h (range, 4 to 10 h) between the methacholine and the exercise challenge tests was allowed in order to avoid any effect of the administration of the P2-mimetic agent on EIB evalua-tion. A provocative dose of a substance causing a 20% fall in FEV1 of <4 mg and/or a decrease in FEV1 of > 10% postexercise led to a positive diagnosis of BHR (BHR+). The sputum induction and sample processing were performed according to recommendations. Briefly, increased concentrations of hypertonic saline solution (3%, 4%, and 5%) were nebulized using an ultrasonic nebulizer (Fisoneb; Fisons; Pickering, ON, Canada) for three runs of 7 min each. The subjects were then instructed to expectorate. Salivary squamous cells contamination was reduced by pouring the expectorate into a Petri dish and selecting the dense portions. Then, the sputum sample was homogenized using dithiothreitol 0.1%, and the total cell count and viability were determined. Slides were prepared by cytocentrifugation (Shandon Southern Instruments; Sewickley, PA) and were stained using Wright dye to determine the differential cell count by counting a minimum of 400 nonsquamous cells. The results were expressed as the percentages of total nonsquamous cells. More infromation about sputum induction – here.